Naamah Berkovitz, born in Ein Hod, Israel. Lives and works in Tel aviv. He graduates of the master-class figurative painting school ” Hatahana” Tel Aviv, 2007-2010. Berkovitz, a figurative painter, has been working for a month in October 2014 in the studio of Espronceda, creating a series of works in oil sticks and pencils on paper. ‘Holyland’ is a group of works revolving around the topic of construction sites and it’s derivatives. The name ‘Holyland’ refers to a big architectural site in the hills of Jerusalem. A controversial project in the Israeli landscape. The topic of the building and destruction over times in the Israel landscape is a well known and charged argument. 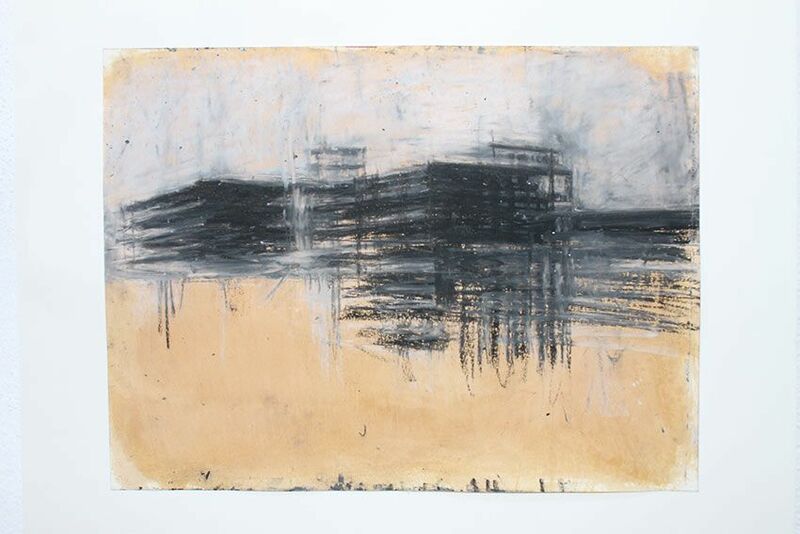 In the works exhibited at Espronceda, Berkovitz refers to architectural formations on their way to becoming buildings. Throughout the process of painting, Berkovitz is repeatedly constructing and deconstructing her images, decontextualizing them in an abstract matter. In the end this process leads to a result of distilled impressions of architectural structures.